By now, you know what a basic scene is and how to plan a scene. Today we’ll move past the planning to the writing stage. 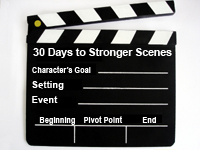 When you write a scene, it helps to break down the actions and emotions into a beat sheet. Some people use beat sheets to refer to the flow of scenes, but here, I’m using it to refer to the flow of actions and emotions within a single scene. Here’s an example of beats within a scene I was just working on. In some ways, you might notice, this detailed beat sheet reads like a narrative summary. What’s missing is the detailed development of the scene with full dialogue, action, emotions and thought. Some people even write a full novel with narrative summary, then go back and expand. I feel like that’s what I’ve done on some of my early drafts. Using a detailed beat sheet for a scene, you can go on and write it easily. The key here is to remember that the beat sheet is a guide for the scene. By developing it early, you’re forced to think about the progression of action and emotion and take into account the physical/emotional settings. However, as I write from a beat sheet, I invariably find ways to introduce more tension. I don’t mind adding, subtracting or shifting the beats as needed when I write. The beat sheet has done it’s job at that point by keeping me focused and I’m willing to let the writing take a tangent course, as long as the focus is getting sharper in the process, instead of blurrier.